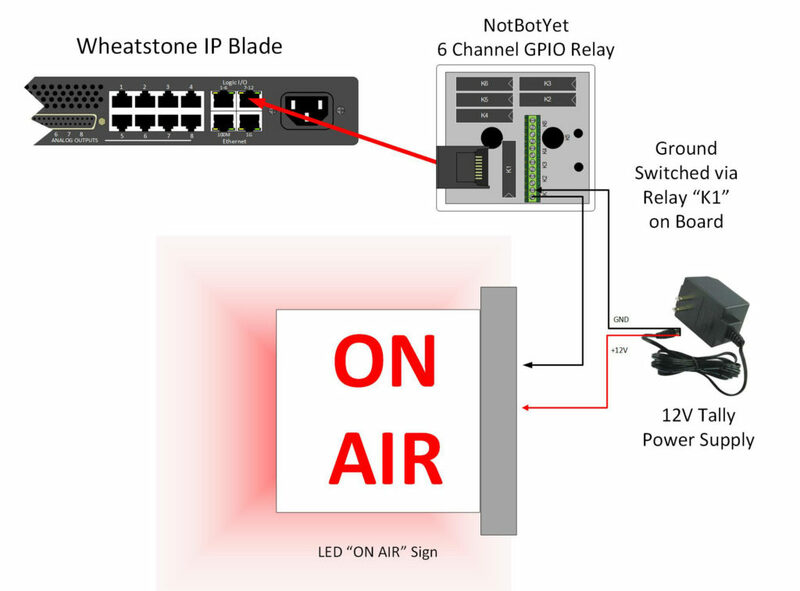 The NotaBotYet 6 Channel GPIO Relay Board can be used in conjunction with the logic ports on Wheatnet-IP Blades to control most LED-based on-air lights for studios. Most of these types of lights run on 12 volts and can use up to a couple hundred milliamps of current. This is beyond the limitation of a Logic I/O port on Wheatnet-IP Blade device. Many engineers have resorted to creating some type of perf-board circuit with transistors or relays to control these on-air lights. Some have even used expensive high current relay products designed originally to switch a single old fashioned 110-volt on-air light. The problem is that few of these methods are easy or quick to install, and some are just downright expensive . With the NotaBotYet 6 Channel GPIO Relay Board, NotaBotYet has already done the heavy lifting for you to make your installation fast, easy, and cost effective. Typically, when using this board, the most time will be spent screwing the on-air light to the wall, rather than the actual hookup. The diagram above demonstrates how it all goes together. All that is required to get the on-air light lit is: an LED-based on-air light, a Logic port on any given Wheatstone IP Blade device (it is assumed the programming to activate the bit on the port when a mic is open on the console has already been completed in the Wheatnet-IP environment), a 12v power supply to power the light itself (usually included with the on-air light), some wire (between the on-air light and the board and power supply), and the NotaBotYet 6 Channel GPIO Relay Board. 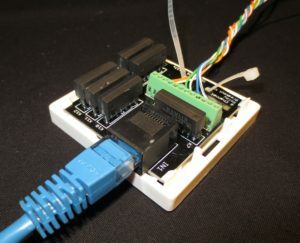 The board easily connects to the logic port of the blade with a simple cat 5 cable. The input pin-outs of the 6 Channel GPIO Relay Board already match those of the logic port of the blade. 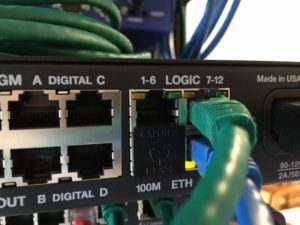 This allows the use of any pre-manufactured straight-thru cat-5 patch cable to be used for this purpose. The normally open relay contacts will activate upon the GPIO port bit closing to ground, thereby completing the circuit to the on-air light, and remaining completely electrically isolated from the other relays on the board as well as the GPIO port itself. Output connections are made on a standard “phoenix” type terminal block. Use of this board does require that all the logic bits on the particular port are set to “output” mode. However one device can control up to 6 on-air lights simultaneously. That has the potential to offer very significant cost savings over solutions that can only light one on-air light.